I just loved making this cute card and believe me it wasn't easy as my mojo seems to have gone right out of the window when it comes to paper crafting. I've been spending a lot of time with my first crafting love of crochet lately and it's reeled me in and got me hooked (forgive the pun) so finding the paper crafting love has been tough. BUT, what really got my juices flowing were the pre-release videos we got to see this week from Stampin' Up! of the Autumn Winter 2018/19 catalogue. Now whilst I've far from come to grips with the new annual catalogue yet and still have things unused from Spring/Summer and Salebration I have not dreaded this new catalogues' arrival as much as I thought I would. In fact I am pretty excited to grab some of the Halloween and Christmas goodies that I've seen already. So, that will all be to come in the next few months but for now I went with retired stuff. I do like to use retired stuff as I'm sure lots of you have it and also buying retired is a good way to enjoy Stampin' Up! if you're on a tight budget and also I do like to inspire people to craft with whatever they have, for me it's not about whipping you up into a buying frenzy it's about getting you into trying something creative and you can do that with a piece of card and a pair of scissors. 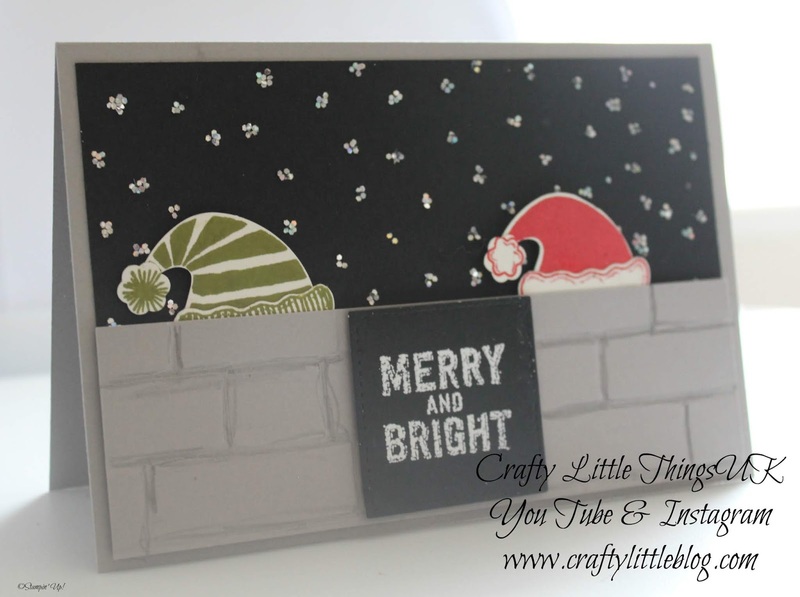 For this one I wanted to give the impression of Santa and one of his elves sneaking around at night delivering gifts so I made it super simple and created a sequinned night sky and a brick wall and just popped their hats over the top of it. I used the retired Watts of Occasions for the sentiment which was heat embossed using white embossing powder. Hope you like this one and that it perhaps inspires you to have a go at something really simple and easy yet effective. There is a video on my channel with all of the dimensions and instructions for composition as usual, you can CLICK HERE to access that. Enjoy the end of the weekend and thanks for dropping in. Be sure to come back to take a look at the Joy of Sets blog hop on 1st August, we're all CASEing something from the main catalogue and who knows we may all have chosen the same design, which would be hilarious.